Ottawa has widened economic sanctions against Russian companies in response to the downing of Malaysia Airlines flight MH17. Canadian Prime Minister Stephen Harper declared the new measures, directed mainly at firms with links to the arms industry, on July 24. Canada has imposed a new set of sanctions against a range of Russian companies over what it sees as Russia’s failure to end support for pro-autonomy militants in eastern Ukraine after the downing of Malaysia Airlines flight MH17. “In addition to instituting prohibitions on dealings with respect to entities related to Russia’s arms industry, these substantively new measures impose restrictions on the issuance of new financing for the designated energy and financial entities,” said the country's prime minster, Stephen Harper on July 24, according to the Itar-Tass news agency. Harper added that Canada was “ready for further actions” if Russia does not change its policy towards Ukraine. According to him, the new sanctions touch "a wide circle of companies tied to the Russian military industry, as well as to the financial and energy sectors." There are ten companies and banks on the list: Vnesheconombank, Gazprombank, NPO Mashinostroyeniye (a producer of missiles, satellites, and manned spacecraft), Bazalt (a producer of unguided aerial bombs, grenades and grenade launchers), the Almaz Antey Concern (a maker of anti-aircraft weapons), the Kalashnikov Concern, the KBP Instrument Design Bureau (another maker of anti-aircraft technology and firearms), Russia's second largest gas producer Novatek, the Radioelectronic Technologies Concern (a producer of radar systems and counter radio-electronic devices) and the Sozvezdie company (a producer of communications systems). The sanctions also include the self-proclaimed “people's republics” of Donetsk and Lugansk in Ukraine and eight of their representatives. Harper's announcement specifies that the sanctions "impose restrictions on the issuance of new financing for the designated energy and financial entities." Economic and visa restrictions are imposed on those included on the list. Experts inteviewed by RBTH think that the sanctions will not have a pronounced negative effect. "Canada's new sanctions are just a repetition of those already introduced by the U.S. The losses that Russian banks will experience as a result will be disproportionately less, since the financing they receive from the Canadian market is insignificant," says Ilya Prilepsky from the Economic Expert Group. "The Russian banks included on the list will have few direct losses," says Fibo Group analyst Vasily Yakimkin. "Today Russia's corporate foreign debt of $600 billion comes from European bank loans (more than 75 percent), as well as American bank loans (almost 20 percent). Russia does not depend much on Canadian credit organizations," notes Yakimkin. With regard to the military-industrial complex, Russia's collaboration with Canada is insubstantial, remarks independent military expert Dmitry Litovkin. A major project between Rostec and the Bombardier Corporation to produce airplanes on Russian territory was frozen during the preceding round of sanctions for an indefinite period. Earlier, Bombardier and Rostec had agreed to create a joint venture on a parity basis in the Ulyanovsk Region in 2014. The overall volume of investments in the project was estimated at $100 million. Bombardier was to supply the technology for the production of airplanes, the know-how, the intellectual property rights and the construction documentation. Canada first imposed sanctions on Russian banks and companies in May 2014, when 16 Russian banks and companies were placed on a blacklist. The sanctions list has been expanding ever since. 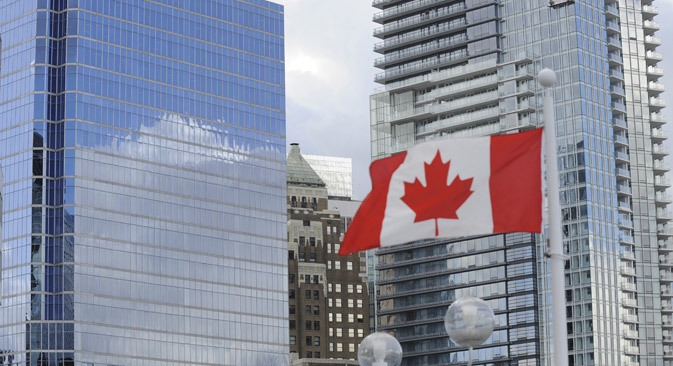 As of mid-July 2014, Canada's sanctions affect 114 Russian individuals and companies.